Also, they take time to extract reviews from Mike on the webcomics he viewed under meds, and Sam explains his love/hate relationship with Mark Millar and particularly his work on Ultimate X-Men. What is Alex’s Pick of the Week? What does Sam insist he’s picked in his heart of hearts? All this and more this week, tune in and enjoy! It was Mother’s Day around the time of our third podcast, so we decided to peruse Marvel’s epic event comic about a mother’s love for her imaginary kids. 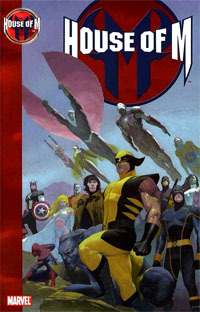 It’s the “House of M” trade paperback, by Brian Michael Bendis and Olivier Coipel. Our verdict? Listen to the damn podcast and find out.